As an authority in eco-friendly buildings, Bryan McElveen brings a unique perspective to the real estate market in Charleston. He specializes in communities located in Downtown Charleston, North Charleston, and Mount Pleasant – from high-performance homes in Park Circle, to faithfully preserved historic homes on the Charleston Peninsula. 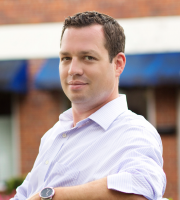 Since 2012 Bryan has authored Charleston Livability, a website pertaining to sustainability-minded real estate, eco-conscious retrofitting, and local livability. Bryan is a South Carolina native, instilled with a love for the natural environment that makes Charleston one of the greatest places to live. When not creating masterpieces in the garden or kitchen, he can be found enjoying life on the rivers and beaches of Charleston.